Caldecott Award | The Loudest Librarian! Every January, I try to do a series of storytimes related to the upcoming announcement of the newest winner of the Caldecott Medal. This year’s winner will be announced on Monday, January 27 at the Midwinter Meeting of the American Library Association. This week, I read some of my favorite Caldecott Medal Winners from previous years, both for my Family Storytime, and to two classes of second graders. But before I get to those, it occurred to me that I had never thought to wonder who Randolph Caldecott was, and how the award came to be named after him. So I looked him up. According to the Randolph Caldecott Society UK web page, Caldecott was a British artist, who lived from 1846-1886, and was known for his children’s book illustrations. Every year, he would select or write a collection of stories and rhymes, which he would illustrate and publish at Christmastime. The books were enormously popular, and brought him international fame. Like many of the best children’s authors and illustrators (Dr. Seuss, Maurice Sendak, Margaret Wise Brown, and Beatrix Potter to name a few), Caldecott never had children of his own. Sadly, he suffered from heart problems and gastritis, and died a few weeks before his 40th birthday, while traveling in St. Augustine, Florida. I haven’t been able to find an explanation for why the American Library Association in 1937 decided to name the medal after Randolph Caldecott. After all, according to the guidelines, the award-winning artist “must be a citizen or resident of the United States,” and Caldecott was British. Why not name it after an American illustrator like Johnny Gruelle, Wanda Gág or N.C. Wyeth? My only guess is that it had to do with the quality of Caldecott’s illustrations, and the seamless way he integrated them with the text. Maurice Sendak is quoted as saying, “Caldecott’s work heralds the beginning of the modern picture book. He devised an ingenious juxtaposition of picture and word, a counterpoint that never happened before. Words are left out—but the picture says it. Pictures are left out—but the word says it.” And that is the quality that defines the best picture books. I just learned about a new book by Leonard Marcus entitled Randolph Caldecott: The Man Who Could Not Stop Drawing. I will have to check it out to find out more, especially after reading this intriguing conversation between Leonard Marcus and Brian Selznick, winner of the 2008 Caldecott Medal (I love to show kids Selznick’s book The Invention of Hugo Cabret, which is not a picture book, but a 533 page heavily illustrated novel). In the meantime, you can see samples of some of Caldecott’s illustrations on the Randolph Caldecott Society web site. I think about this book every time I stand on a swivel chair, which I do often, in spite of this being in part a cautionary tale about that very thing. My only complaint about this book is that it’s really one you want to sit down with and pore over by yourself, to enjoy all the humor in the illustrations, and some of that gets lost in a storytime setting. But the kids love it anyway. At my family storytime, many of them exclaimed over it when they first saw me pull it out of the stack, so clearly they had heard it before (and hopefully had a chance to look at it up close). 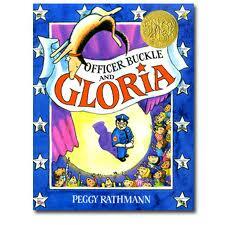 Officer Buckle’s safety speeches suddenly become a big hit at schools when he is partnered up with a new police dog named Gloria, until Officer Buckle discovers why. This is a wonderful story about a friendship and the importance of working together, and it has great safety tips besides. I remember being surprised the first time I saw this book, because the style was so drastically different from Henkes’ other books like Chysanthemum and Lilly’s Purple Plastic Purse. But since then, this has become one of my favorite read-alouds (along with A Good Day, which is perfect for toddlers). 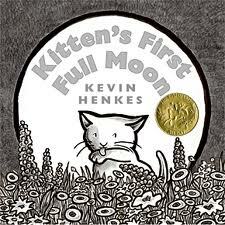 The language in this book is so simple, and compelling: ”It was Kitten’s first full moon. When she saw it, she thought, there’s a little bowl of milk in the sky. And she wanted it.” The story is funny because of all of Kitten’s mistakes and accidents, but you also feel her frustration, so it is deeply satisfying when she comes home wet and exhausted to find her own bowl of milk on the porch. There was a little tussle over who was going to get to check this one out after I read it. I’ll admit, I hadn’t ever noticed the mouse and the red balloon that appear several times throughout this book, until one of the second graders pointed them out. And then I was instantly transported back to reading Goodnight, Gorilla by Peggy Rathmann with my son when he was small, and trying to find the red balloon and mouse on every page. It’s a subtle reference, but I loved it. The kids loved the pictures of the zoo animals packed into the bus to visit their sick zookeeper friend, and the idea of the owl being afraid of the dark. B-I-N-G-O To go along with Officer Buckle and Gloria, I brought out the library’s St. Bernard hand puppet (who likes to lick people’s faces), and we barked the missing letters. INSTRUMENT PLAY WITH A CD: Old MacDonald Had a Farm by Rufus Thomas from Sing Along with Putumayo (Amazon.com link) This rock-and-roll version of Old MacDonald is always fun. 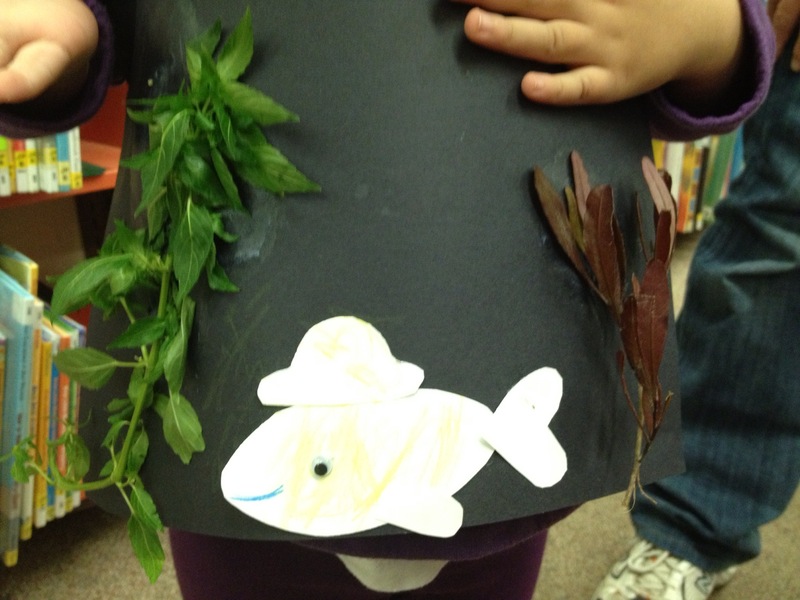 For this craft, I cut out pieces for the kids to color and assemble the little fish from This is Not My Hat, and brought some plants from my yard for them to glue down. 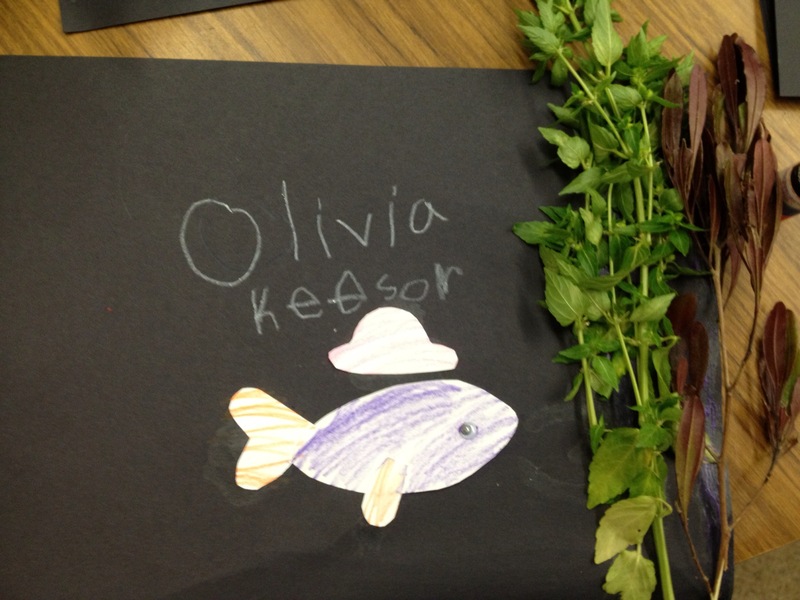 I originally had a crazy idea for taping the fish to a piece of yarn, and cutting a slit in the paper, so it would look like the fish was disappearing behind the plants when you pulled the yarn. But I would have needed thicker paper, and it seemed to complicated for the short time the kids had to assemble the craft. Still, I mocked it up with my daughter, and even though we tried it with construction paper, which is flimsy, she still had a lot of fun playing with it. 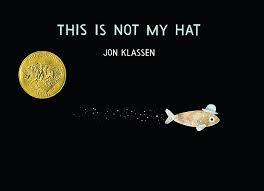 This is one of my absolutely favorite Caldecott winners to read aloud, although I usually share it with older kids. In 1974, Philippe Petit walked, danced, ran, and lay on a tightrope across the Twin Towers. It was an illegal act, so he and some friends disguised themselves as construction workers, then carried the 400 pound cable up the elevator, and then up ten flights of stairs to the roof. Getting the wire across the gap was a harrowing experience all its own, and at one point, the cable fell, pulling Petit’s friends in the other tower to the edge of the roof. And then he stepped out onto the wire, a quarter of a mile above the ground. The illustrations in this book are dizzying. The kids are always transfixed. And even though Petit broke the law (yes, another naughty character, but a real one! ), he did so ready to face the consequences. After he stepped off the wire, he held out his hands for the cuffs. He was sentenced to perform in Central Park for free. There is one line at the end of the book that says, “Now the towers are gone,” and always, always the kids ask why. The first year I read it, I wasn’t prepared, and in the pause while I tried to frame my answer, I could hear a bunch of kids exclaiming to each other the bits of information they knew. Fortunately, I knew that this year on September 11 the principal at the school had spoken to all of the classes in the school, explaining about the tragedy, and telling the kids that they should “remember the heroes.” So this time, when the question came, I was able to remind them of that, and, while I’m sure they still had questions, they seemed to accept that. That question is the only reason I haven’t read this book at my regular storytime, since I’m not sure how comfortable my storytime parents will be with whatever explanation I give, and the inevitable questions that will follow. 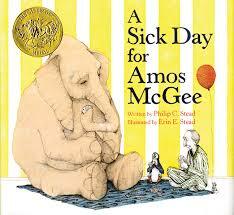 But otherwise, this is an exhilarating book, and one of the best examples of a nonfiction picture book I know. I shared this book with the second grade because I wanted to show them that they all knew at least one Caldecott winner. This book is so much a part of our popular children’s culture now (most of the kids had seen the movie too), but I also wanted them to stop and think about how revolutionary the book and the art were when it first came out. Max is the ultimate naughty character, fulfilling that fantasy all kids probably have of running away and going wild. I like to mention how controversial this story was, even down to the last line. In an interview, Sendak once talked about an argument he had with his editor, Ursula Nordstrom, “One of the fights I had with Ursula—and her whole office—though it seems silly now, was with the last line of the book [about Max’s dinner]: “and it was still hot.” It bothered a lot of people, and they wanted me to change it to “and it was still warm.” Warm doesn’t burn your tongue. There is something dangerous in “hot.” It does burn your tongue. Hot is the trouble you can get into. But I won.” We were lucky Sendak was always a bit like Max. This was one of my favorite books as a child, and I still love it. Sylvester the donkey is thrilled to find a pebble that makes wishes come true, until he has a run-in with a dangerous lion, and accidentally wishes he were a rock. Steig really draws out the drama of Sylvester, helpless and alone on the hill as the seasons pass, while his parents worry and mourn. Of course, it has a joyfully happy ending, where the family is reunited, and they decide to lock the magic pebble away, at least for a while, realizing that now that they were together again, “they all had all that they wanted.” Before I read this book, I usually tell the kids that William Steig wrote the picture book Shrek, which, oddly, most of them have never seen, although most of them have seen the movies. I made the mistake of reading this book last to one of the classes, and it was a bit too long. Still, it’s a fun collection of facts about the presidents, both the traits that many of them shared, as well as the things that made each one unique. The illustrations by David Small are colorful and funny, and there are some great quotes scattered throughout the text. My favorite is from Ulysses S. Grant, about his own musical ability, “I know only two tunes: one of them is Yankee Doodle, and the other isn’t.” This is a great book to share on President’s Day or around Election time. You can find the complete list of Caldecott Medal winners here. Please tell me your favorites, and more importantly, who do you think will win this year?